Katie Gletty-Syoen works on her garden at her Johnson Street home. 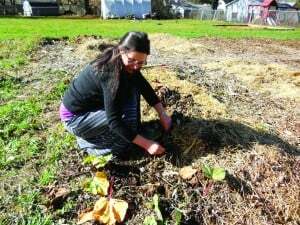 She is spearheading an effort to create a community garden in the village, in which residents can rent plots. I was honored to have the opportunity to chat with a journalist from our local paper about the Community Garden plans! Read the article here. There is one correction….The garden is slated to be situated between the McFarland United Church of Christ and The Homestead, a housing complex (NOT A CEMETERY). The rear border of the proposed garden plot is the Lower McFarland Cemetery. I am asking that the editors of The Thistle make note of that correction in the next issue. Welcome to the website for the McFarland Community Garden! Please send an e-mail if you have any questions. Thanks! Registration Open for NEW Gardeners! How Do I Get a Plot for the 2018 Growing Season?